Last year, I didn't stay on top of my goals. I didn't stay on top of posting, either. But this year I intend to be more successful with my annual goals and the easiest way to do that is to periodically review them. I even have a small piece of paper with them jotted down that I can see all the time! So, with 1/12th of the year already gone, how am I looking? 1. 65% Japanese Type Collection. I've gained about 2.5% in the past month, and at this rate I'll reach 65% in three months. But then, I went to a card show and did a lot of singles hunting over the New Year vacation. I still think this is doable - I'm working on a trade for vintage Japanese cards now that will hopefully lead to several more in the coming months - despite needing to update and correct details on sets for the past five years. 1b. Finish Calbee: I haven't made any progress. But I knew it wouldn't be easy. 2. Continue Calbee posts: I've been busy catching up on trade posts and new releases, so I haven't addressed this yet. I'm almost done with trade packages. Maybe another week or so? This is what happens when you pack a year of trades into two boxes. 2b. Start BBM posts: I'm still posting new release details, but I haven't looked at old BBM sets yet. 2c. Make a Table of Contents: It's still in-progress. I think it'll be my project one week. 3b. Preview/review 2014 MLB sets: I've done a couple previews for sets I'm looking forward to seeing. I skipped the Triple Threads preview. No Bowman preview. 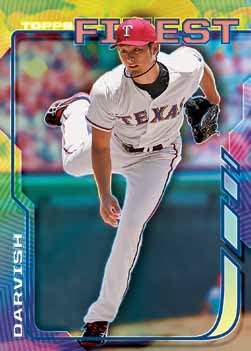 And despite a lack of real enthusiasm for flagship Topps, I'm expecting to go to a card store this weekend and bust a pack or two. 4. Do something with the Zoo: Nothing yet. 5. Finish the NPB Live Game Collection: I've really worked hard on this collection, and I had the list down to about 10 more cards. But, then, I realized that I had the wrong game cataloged and collected! So, now I'm in the 30s. Again, something I hope to remedy this weekend. 5b. Start the MLB Live Game Collection: This goal has been MET! Somehow, I found the time to build the checklists for all 80 games. Then, I spent several days going through all the extra cards I still have thanks to Kenny at Cervin' Up Cards, and other traders, and knocked about 22% of the cards off the list. There are 2321 cards in the complete list, and I already have 528 of them. I know the list isn't complete, though, because there are lots of games I went to in 2009 and 2010 (mostly at Turner Field) and I suspect a few 2011 games that aren't on my list. I don't want any cards for this collection yet, because I'm sure that whenever I get back to Georgia I can fill almost all of it with my existing extra cards. 6. Collect 2014 sets: With flagship Topps just hitting stores, I can't really start this, though I'll buy the complete set this summer. 6b. Collect 2014 insert sets: The only insert from Series 1 that I want at this point is the 1989 Minis. Hopefully they won't be too expensive. 8. Post about NPB awards: nothing yet, but once I finish my backlog of posts I'll go after this. So, 1/14 done, several others are successful. I'd say I'm on track for now. And with this post, that's a full month of daily posts, which I haven't done in two years! Back to the trades, new arrivals, and new releases tomorrow! They come from a land down under! What a great song! I have a new foreign coworker from Australia - the Melbourne area, to be a little more specific. Not long after he arrived, cards from Adam at Australian Custom Baseball Cards showed up in my mailbox. As you may expect, his blog is devoted to creating custom baseball cards for Australian players, and the Australian baseball league. But he also collects Australians, and a few of them have played here in Japan. So he sent me some Australian cards, and I'm about to post him some Japanese cards of Australians. Confused? Oh well. This is a Dingo card from last season. It's a nice, fun design! I think these were team sets. Select issued team sets for the 2011-12 season. I considered ordering these, but there was no way to order them and have them shipped out. There were a few larger sets issued in the 1990s by Futera. I'm pretty sure they still make soccer cards. This is probably a 1995-96 card, which doesn't seem to be listed in Beckett or SCF. Here's the Rookie of the Year! Those shades are stylish. This is a subset in the 1995-96 set. Steve just looks happy to be here, playing at the All-Star game. Another 1995-96 subset! This is an actual insert, called Bottom of the 9th. It's serial numbered out of 3000. This is from the 1995 Futera set. I like this design better. Here's a subset called ABL Veterans. This Adam Burton card is from 1993 Futera, which is the first major Australian release. This interesting card looks to be something promotional - it has Mizuno and Pepsi logos and a 1993 copyright. Obviously printed by Futera, it isn't part of their base set. Mitch Nilsson's 2011-12 card has that season's statistics and team logos on the back. I like the simple elegant design here. The 2012-13 card has a little more style - the photo has been cropped and there's a lightning background here and the font is unique. Again, Nakazaki's name in his native characters (kanji) is on the back. And again, statistics are included including a very modest ERA under 14. This year, with the Seibu Lions in Japan, Nakazaki's ERA was under 10. I guess he's getting better? I'm wondering a bit about where he got his cards printed - Adam discusses his thoughts here. I would like to use the same service in the future if I ever get my stuff together to make custom cards. Meanwhile, it's really cool to have these cards, and other than the obvious "not licensed/fan made" disclaimer these look professional - great work! I'm looking forward to our next trade so I can get some more Down Under cardboard! Thanks a ton! Once I started frequenting card shops in Japan, I quickly discovered several of the multi-sport and non-sport sets that weren't listed in Gary Engel's guide. One of those is the annual Real Venus set, which features women in a variety of sports, and is now in its fifth year. The set comes out around Christmas every year, and the 2013 set has 29 "Venuses" (Venii?) plus three legends. Each of the regular subjects has three cards in the set - a posed shot in their uniform, an "action" shot (which sometimes is just posed or part of a photo shoot, called "Playing Venus"), and a street-wear image ("Venus Shot"), which again sometimes uses sports wear (Aya Terakawa's card shows her in her swimming cover-ups). The three legends are shown in action photos. Foil signature parallels of the base set are in gold (#/100), holo (#/50), and (possibly) pink (#/25; was issued in 2012 but I haven't seen any this year). Nine women are included in the Stylish Venus insert set, which includes two more images in street clothes on the front. There are two different autographs for all 29 women - a uniform shot (up to 170 copies) and a plain-clothes shot (up to 100 copies). The three legends also signed 150 or 210 cards each. There are six dual-autograph cards. Karen Iwadare has a Santa costume card (200 copies) with what appears to be a dual-relic version (20 copies) and an autographed costume version (30 copies). There is a promo card of her in the Santa outfit which was included in SCM magazine. There are 22 different cheki (instant photo) cards (17-26 copies each), and four "original print" cards (6-8 copies each). Each pack has five cards, for 315 yen - boxes have 20 packs each. There are some names that seem to appear every year, including gymnastics star Rie Tanaka. But I was quite happy to see Eri Yoshida on cardboard as a baseball player - she played ball in the US for a while. 2014 Topps Finest Preview: I'm Excited! Rocking the Type Collection from BucCollector! Package Grande from Nachos Grande!